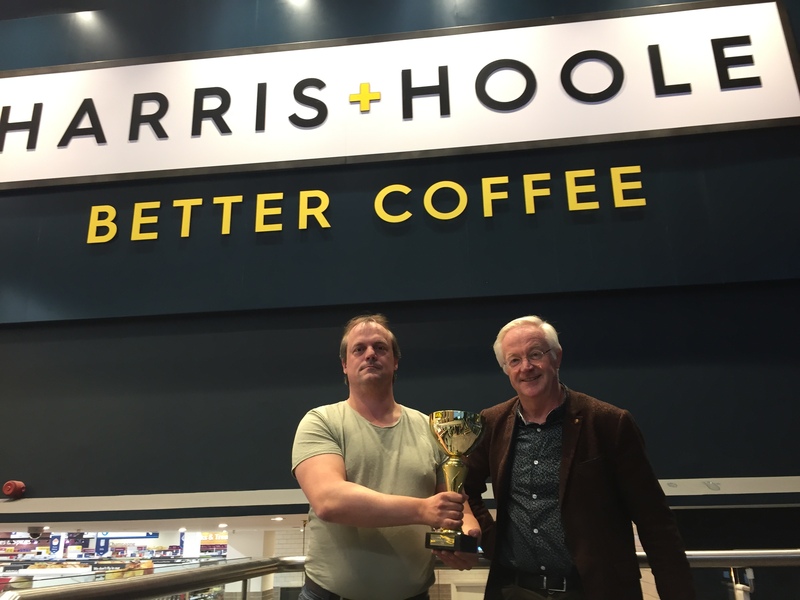 Congratulations to Alex Polden, Supreme Champion of the inaugural 2018 Harris and Hoole Cup, and to Simon Morecroft his very worthy adversary! Having whittled away at the competition since March the surviving eight/32 played out the final rounds of the tournament on 10 November in a reserved area of tables in the middle of Harris + Hoole’s Kensington coffee shop. Surrounded by onlookers asking each other, ‘What are they doing?’, or indicating that they ‘used to play a lot ages ago’, it may not be accurate to say we had the cheering crowds akin to a local derby but nonetheless there was a genuine interest from the public with many of them stopping to take a look and receiving a much coveted UKBGF contact card for their trouble as well as a quick chat from any of the players not engaged in a match at the time. I drew Alex in the quarter-finals and was rather hoping I might be awarded a few points before the match even started as the usual travel chaos that is London threatened to keep Alex from the table. Alas he arrived with minutes to spare and brushed me aside in no time. Feeling hard done by, I was unlucky of course, I took some consolation in seeing other opponents steamrolled by Alex on his way to the final and the win, throwing in a backgammon against Sean Clennell for good measure. Clearly Alex brought back some Irish luck from his excellent showing at the Irish Open the week before. All well-deserved Alex, no doubt. Simon, too had a great result, only coming second against Alex after seeing off Chris Purchase and then Peter Bennet, no pushovers. A very successful day all agreed. Me [left] losing the fight against Chris Hamilton to 7 pts for the accolade of best quarter-final loser! You may remember from blogs earlier in the year that this tournament was trying something a little different. With a view to promoting the game locally, throughout the year players from across London and the Home Counties (with the exception of one Novocastrian) have been battling it out in a single flight single elimination format whereby each round had to be completed by a deadline, typically within 2 or 3 months. The players were otherwise free to meet for their 11 pt matches wherever they could agree. A 10 % discount on purchases tempted some to play their matches in one of the thirty-seven Harris + Hoole coffee shops, while others played in the usual pubs, clubs or other cafés. I think I win the prize for ‘most unexpected playing location’ after finding myself in a mobile home, parked conveniently outside the London Open venue in early May! No 10 % discount or public audience but the free beer and good company sufficed. 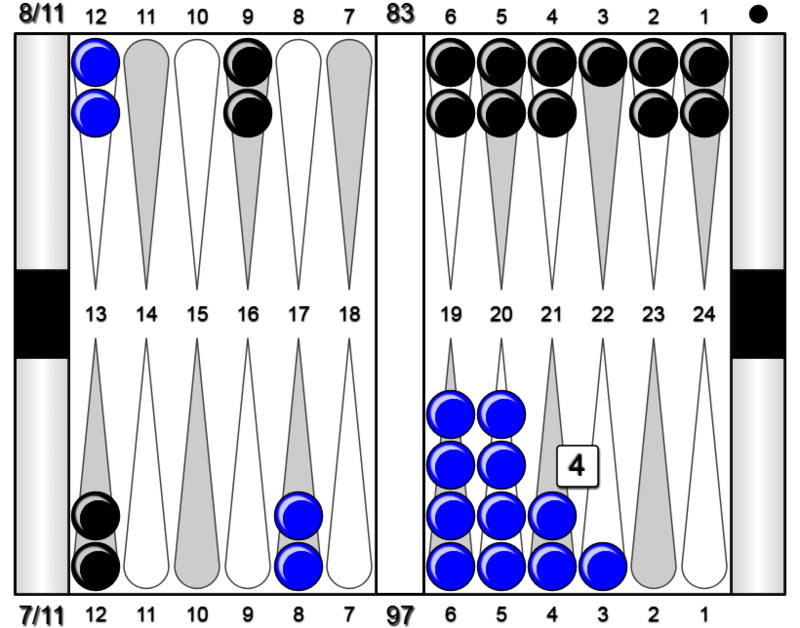 Excluding this example, having the matches played amongst the public can really help raise awareness of the game, and the more new blood we can get interested in Backgammon the better for our sport’s future. 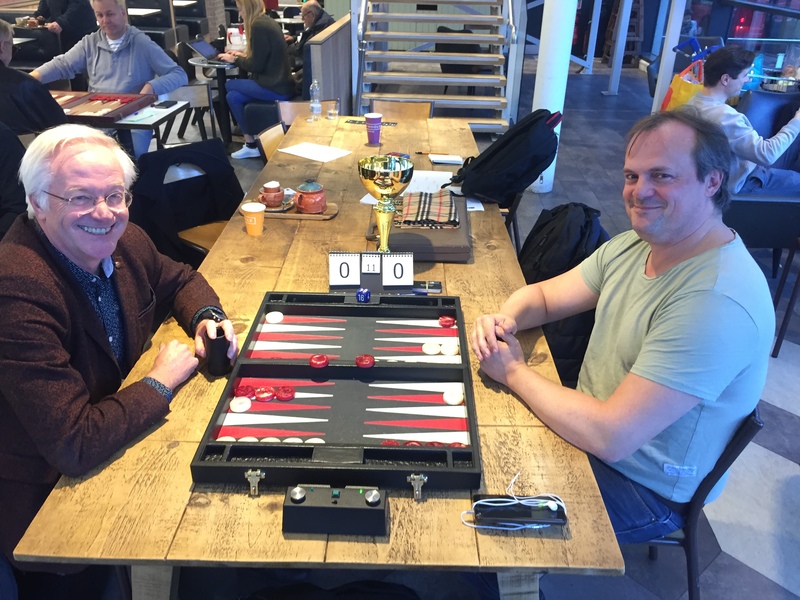 The Harris + Hoole Cup structure has no registration costs and a single entry fee, 100 % of which goes into the prize pools, generously topped up a further 10 % this year by Backgammon in Ealing. Hopefully everyone found something in it for them. The single flight means less experienced players came up against some of the best players in the country and either beat them (hurray) or I hope learned from them, the value of which should not be underestimated, see below. For more advanced players, 11 point matches throughout ensured a decent chance to show their skills while the fee structure ensured a healthy return on their modest investment should they win. The position shown is clear, right? You couldn’t possibly blunder this, agreed? For me this was an example of learning from a stronger player. The position is modified a little from the one in the game to illustrate a point, not for serious analysis, but to demonstrate how over the board thinking can be improved by asking stronger players how they make decisions. This is hardly exclusive to the Harris + Hoole Cup but playing in a relaxed environment less sensitive to time does promote conversation between players, plus I wanted to get a position into the blog! My more experienced opponent had redoubled. As a less experienced player I am often still working from my poorly informed gut. The race doesn’t look good. I thought at the time I am 15 or so pips behind, I should probably drop. I could see other cons, more checkers on higher points (in hindsight less wastage may deem this OK), he is on roll, and this is for the match. Again, a drop. Live to fight another day. Case closed. But wait… Although I would normally drop this based on the race I also thought at the score, -4-3, if I drop now, allowing my opponent to get to -4-1 Crawford, I will probably have a less than 20 % chance of winning the match and that assumes we are equally skilled players. What are my winning chances here where skill is going to be less of a factor on the race home? I don’t know. Probably about one in five I guessed, based on thin air. If it is 20 % now or 20 % later then maybe I should just take now? I took, I lost, match over. Boohoo. The learning came from chatting with my opponent afterwards, who conveyed a more grounded way of thinking about the problem. Indeed if I had dropped I would have been -4-1 Crawford, giving me about 20 % winning chances (18.56 % to be accurate, Kazaross-XG2). Roughly one in five. The crux was that the 16 pip race lead that my opponent had amounts to roughly 2 rolls. Therefore I needed to roll maybe two big doubles more than my opponent to stand a chance of winning the race. With my opponent on 83 pips I suppose I had to do this within maybe nine rolls or less. Will I achieve this in more or less than one in five games? My head says probably a fair bit less. Therefore I should drop now and go with the better one in five chances (18.56 %) of winning later. Although it turns out the take was a .103 blunder, shame on me, I nonetheless left the board happy having learned something new or at least something to go away and understand better. What score would have made this a take? XG says at -5-3. I assume this is because at -5-1 Crawford my winning chances drop to 15.8 % i.e. less than the current position’s winning chances of 16.59 %. Not sure I would be able to calculate this over the board! Another way of looking at it is that if I take the 4 cube at -5-3 I will immediately recube to 8, and 5 of those points are valuable to me whereas only 3 are useful to my opponent, thereby skewing the odds in my favour. What race deficit would have made this a take? Apparently being just 2 fewer pips behind in the race compared to my original position above might have made it a take, see below, with 19.1 % winning chances, and a .022 mistake to pass. Wow, small adjustments make quite the difference. No doubt I haven’t yet fully grasped the teaching, so there is much learning ahead, but that for me is why backgammon is such a great game! Back to Harris + Hoole. 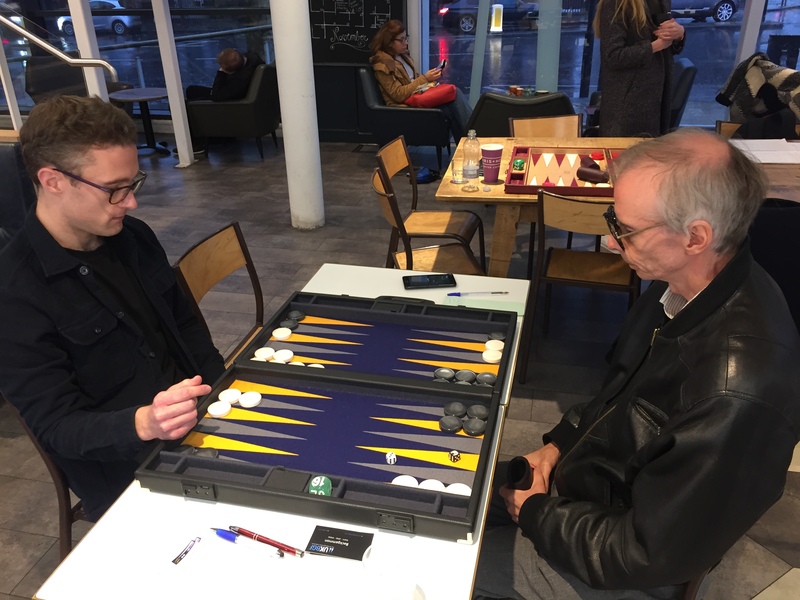 For those exiting the tournament early before finals day, Backgammon in Ealing hosted the consolation tournament earlier in the year, with a great turnout of players. A straight knockout through 7 pt matches saw Emad Salib surface as the winner beating Michael Ireland in the final. Backgammon in Ealing have already reported on this day on their Facebook page. Clearly evidenced was that there was plenty of fun and lots of backgammon featuring some very strong players. The Harris + Hoole Cup has had a great first year thanks to the support of Harris + Hoole’s Vicci Cottington, and the organisation from Backgammon in Ealing’s Darren Woodcock, Peter Bennet and Anna Price. I will be taking more of a leading role this coming year and we hope the tournament for 2019 can be bigger and better. Now is the time for us to consider how to achieve this. For those who took part this year, thank you. We would really like your feedback on the format, the entry cost and anything else you want to tell us. How can we make it better and more accessible while ensuring we cater to the needs of the majority? Any feedback is welcome and greatly appreciated. We will take everything into consideration and hope to release more information on the 2019 tournament in the New Year. Thanks again to all involved. If you want to get in touch directly please email me at johncircleyellow@gmail.com. Alex [left] lording his trophy over Simon! Its impossible not to notice that Alex is getting a lot of quality results at the moment. Great stuff, well done.